With only three ingredients, you could be enjoying a Matcha Milkshake, packed with antioxidants and creamy sweetness, in just minutes. 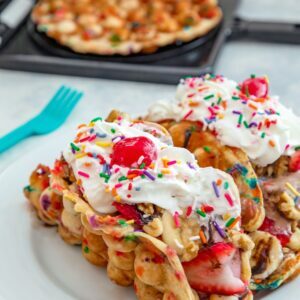 Add whipped cream, sprinkles, and mini donuts for some extra fun! Guys, do you remember when it was really cool to wear a feather in your hair? OK, maybe it was never “really cool,” but it was definitely a trend… I want to say back in 2011. I remember seeing it everywhere (and by everywhere, I mean on Selena Gomez and Miley Cyrus) and when my hairdresser told me she could give me one for $15, I went for it. I felt so cool for like a week and then the feather started to get ratty looking and gross from being washed and dried so many times (btw, I used to wash and dry my hair every single day and then my life was changed when I realized I didn’t have to and that my hair would be much healthier if I didn’t. If you need to join an “I have oily hair and think I need to wash it every day” support group, I am happy to lead). I’m pretty sure the trend lasted like 2 months and then disappeared never to be seen again. I could probably find a photo of me showing off my hair feather extension, but I’m too embarrassed to show you. Some trends are incredibly fleeting and probably never should be brought into existence. And some trends are brilliant and will remain for so long that they won’t be considered trends after a while. Think quinoa. It was considered super trendy, but never disappeared and is now just a normal part of most of our lives. That is what I predict for the future of matcha. Matcha, a type of green tea, seems so trendy in the U.S. right now (and many are listing it among the top food trends of 2018), but I don’t think it’s going away any time soon. I’ve been loving matcha water with honey and lime for a while now and have now started incorporating it into more of my baking, like in these Matcha Cranberry Donuts. 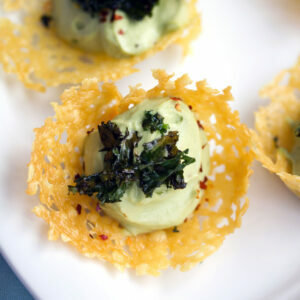 There are a million creative ways to use matcha powder out there these days and I think that list is going to grow and grow. Do you know about the benefits of matcha? 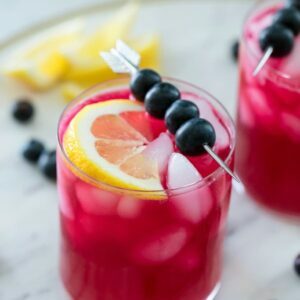 There are a ton, but some of the biggest include the fact that it’s super high in antioxidants (including EGCg, a cancer-fighting catechin), it can boost energy in a healthier more sustained way than other forms of caffeine while also promoting focus and memory (due to the properties of L-theanine), it can help detoxify (due to chlorophyll), and more. Since it’s so healthy, I figured why not add ice cream to it? Seriously though, I love the flavor of matcha and when combined with something a little sweet and creamy, it’s a dream come true. That’s why matcha lattes are so popular. I made little donuts to serve with my matcha milkshakes, but this is most certainly not a requirement; just cute and fun! Especially if you make icing with matcha powder in it, too. If you want to make them, I used this mini donut recipe and simply omitted the espresso powder. The icing is just powdered sugar, milk, vanilla, and either matcha powder or food coloring. This (affiliate link) is my current favorite matcha powder. I always look for a quality matcha that has high reviews, but also doesn’t cost an arm and a leg. What’s your favorite? Any I need to try and that are worth spending the money? 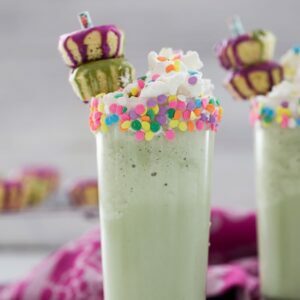 This matcha milkshake only involves a few ingredients and while I was tempted to add a few more components in, once I tasted it, I realized I had to leave it as is. It was so flavorful and perfect and really wouldn’t have benefited from any other additions. If you use a quality vanilla ice cream (I recommend vanilla bean), you will get a marvelous vanilla flavor, but if you find it lacking, you can certainly add some vanilla extract. I had mine out to add, but then discovered it was not necessary at all. Of course, I did sprinkle up my glass before pouring the milkshake in. Since you know as well as I do that everything is more fun with sprinkles. Ugh, I also served with whipped cream on top just because I wanted to. I couldn’t get over the color of this milkshake. Sometimes the color of matcha can be a little intense and crazy (see: the donut icing), but when combined with ice cream and coconut milk, it became subdued and minty and reminded me so much of the springtime. 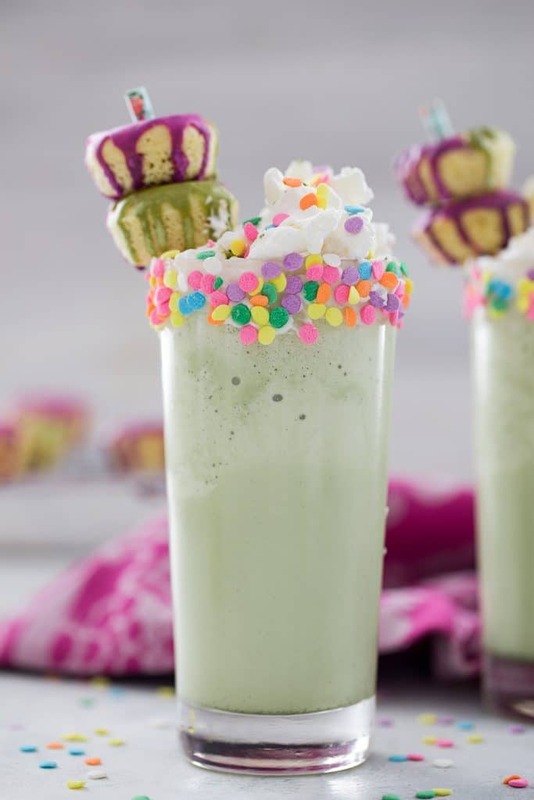 St. Patrick’s Day is coming and Shamrock Shakes (another “trend” that just won’t go away!) are going to be everywhere. I’ve actually never had one, but through this milkshake doesn’t involve any mint, I think it could be an excellent Shamrock Shake substitute. For color and deliciousness alone. And Easter. 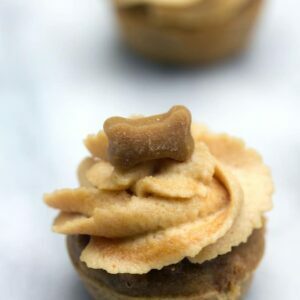 This is a wonderful Easter treat for anyone that is looking for a little sweetness while also still getting a health boost. And I think you can safely serve this to your family and friends without them thinking you’re trying to pull one over on them. I gave one to Chris who happily sipped it up and told me it was awesome. He had NO idea there was matcha in it and has previously been very “meh” about all kinds of green tea. I’m thinking if I drink my matcha water six days a week, I should be allowed a matcha milkshake every Friday. Right?? I mean, if it’s going to get me an antioxidant boost and help me focus on my work, you can’t really argue with that. Remind me of the benefits of vanilla ice cream again? Oh, happiness? That’s what I thought. Those donuts don’t hurt either. 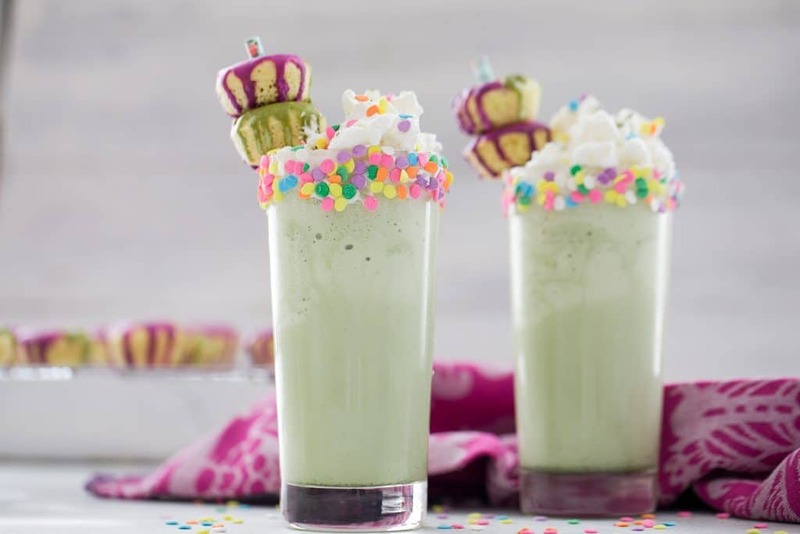 The weekend is almost here, February is half over, and temperatures in the Boston-area are almost up to 50 degrees… And that, my friends, is more than enough reason to treat yo’self with a matcha milkshake. Plus? These are going to be in style for way longer than feather hair extensions. I promise. Do you like matcha? What’s your favorite way to enjoy it? Combine ice cream, milk, and matcha powder in a blender and blend until smooth. If you want to rim your glasses with sprinkles, brush glasses with frosting or simple syrup and roll in sprinkles. 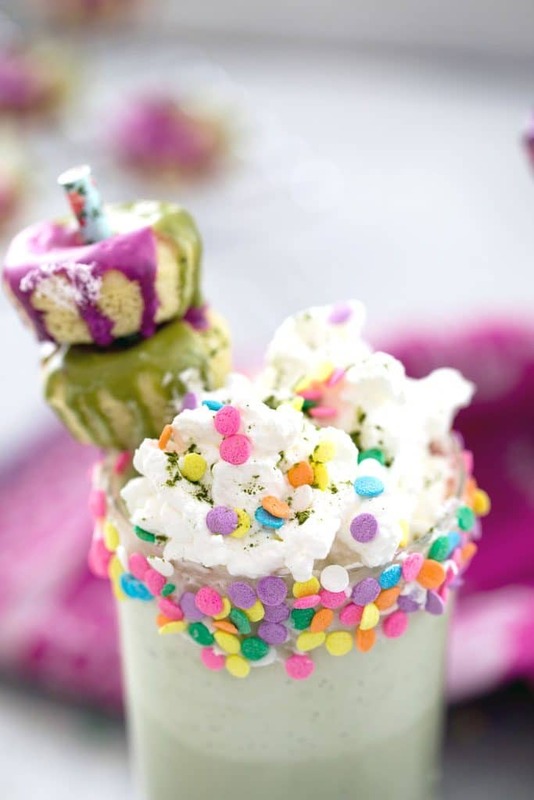 Divide milkshake between glasses and top with whipped cream, mini donuts, and more sprinkles, if desired. 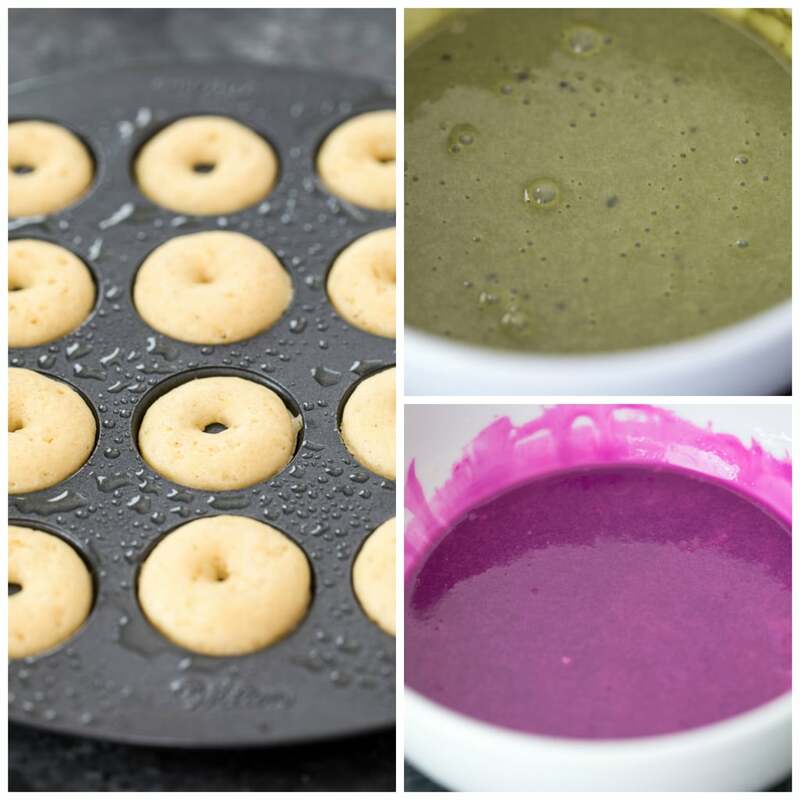 If you want to make the mini donuts pictured with the matcha milkshake, use this recipe, omitting the espresso powder. 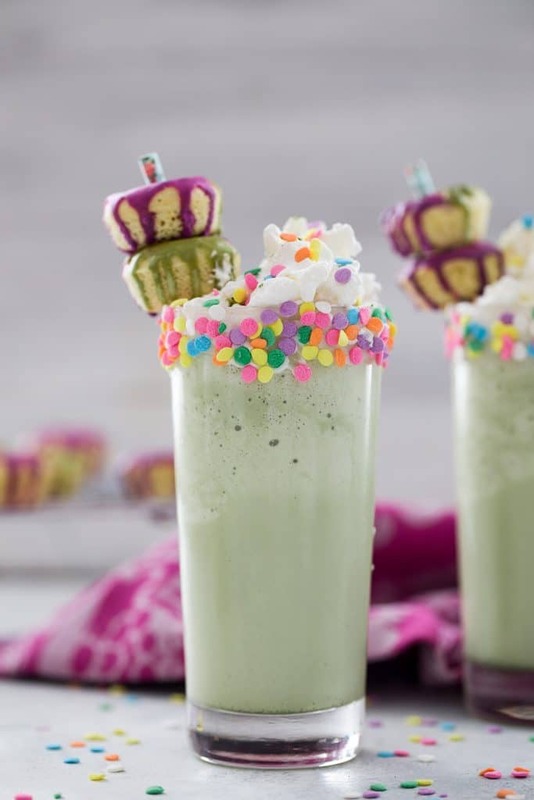 4 Responses to "Matcha Milkshake"
Okay your matcha milkshake is the cutest EVER! I love matcha but haven’t tried it with a milkshake before. These are so much fun! I love playing around with matcha too! Love it Martha! It’s brilliant! 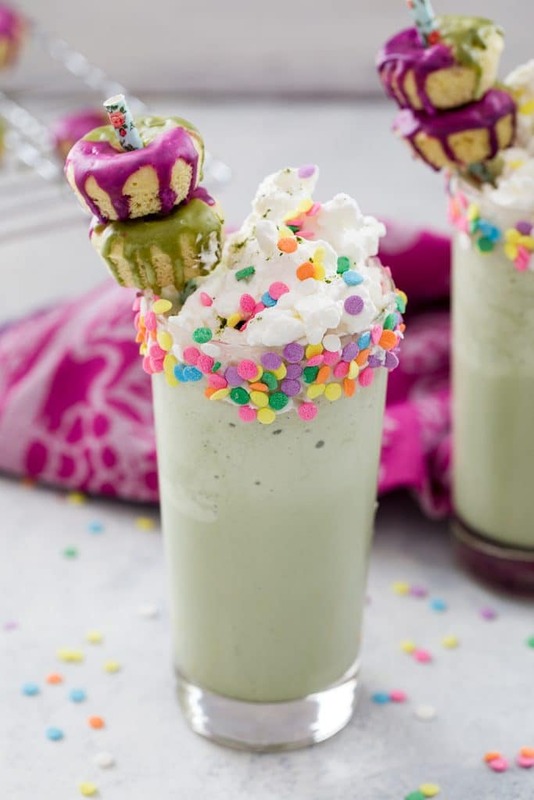 What a great way to incorporate Matcha in a shake and those ‘accessories’ are so cute!